This could be a beautiful shaded walk zone where people could enjoy a stroll in the park along the water, but instead, it’s more like a frying pan. 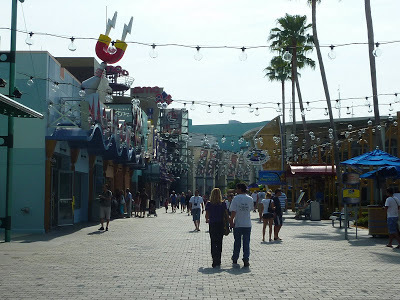 And designs like this in Florida trigger people to say things like, “it’s hotter than hell here,” and “let’s go get ice cream.” Downtown Disney was designed to get people to go into the air conditioned stores to shop and into the restaurants for overpriced cold drinks. On the Environment and Conservation page of their website, Disney states that they’re taking action to protect the planet. 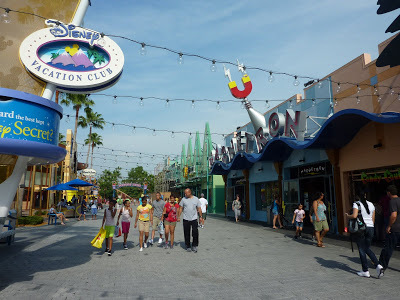 I sure hope that they add Downtown Disney to their list of initiatives soon! They really need to tear up some of the stone walkway and add some trees for shade! It’s nice that they make statements about how they’re helping the planet, but it’s even more important for them to first act local and set an example by greening their own properties. 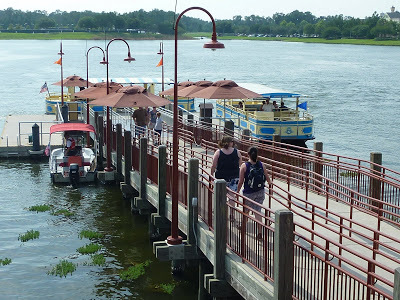 One thing that they did do right here at Downtown Disney was to include a ferryboat where you can go to and from four different resorts. This helps reduce the use of cars and buses and it’s also safer as vacationers go out for dinner and a few drinks–at least they have a safe way to get back to their resort. In the future, it would be great if Disney could connect more of its waterways so visitors could go between and among more of the properties via water taxis. Because I’m staying at the Dolphin Hotel, I didn’t have the option to travel to Downtown Disney by ferry. I need to fess up that I drove my own vehicle to get to Downtown Disney because the bellhop told me that it would take much longer if I took a Disney bus to get there. Not only would I have to wait on both ends for the bus, but the ride itself would take longer because of the frequent stops at various resorts. One of the main issues with public transportation in the U.S. is that it generally takes longer to ride a bus than use your own car. Until we plan for the opposite, people will continue to choose to pay a higher price with their own transportation to save the time. Got any other suggestions to help make Downtown Disney a bit more sustainable? Please leave a comment. I’d love to hear your ideas!